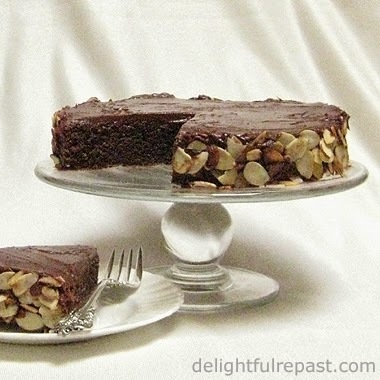 Julia's version of Reine de Saba, a chocolate almond cake, is something I haven't made in ages. It's not that it's difficult, it's just that it does take a bit of time, beating the egg whites separately and such, and makes for more cleanup than I'm interested in doing these days! I've come up with a completely different method and call my version Reine de Saba a la Femme Paresseuse, Lazy Woman's Chocolate Almond Cake. Reine de Saba really is a wonderful cake, but so many people simply don't want to go to quite that much trouble. So, for those people, I give you my version. One that is greatly simplified and yet, I believe, retains fairly well the unique texture, that "special creamy quality" that made it a favorite of Julia's. You will be amazed at the texture of this cake! No stand mixer, no hand mixer, no food processor. No multiple bowls. It is simply mixed by hand in the saucepan in which the chocolate is melted. Resist the temptation to use more almond extract, thinking 1/8 teaspoon couldn't possibly be enough. Almond extract is not like vanilla; it is really powerful and can definitely be overdone. This is a small cake, 7 inches in diameter, perfect for afternoon tea. I do so hate big cakes at afternoon tea! The cake may be mine, but the delicious and perfectly simple icing is straight out of Mastering the Art of French Cooking (though I toasted the almonds for extra flavor and used Kahlua instead of rum). 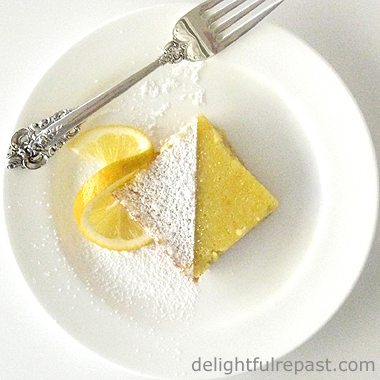 Sometimes I skip the icing and just give the cake a dusting of powdered sugar or a dollop of whipped cream. * If you are gluten-free, use 1 1/2 tablespoons sorghum flour, 1 1/2 tablespoons potato starch and 1 tablespoon tapioca flour in place of all-purpose flour. 1 Preheat oven to 350 degrees. Grease and flour a 7-inch round pan. 2 In 2-quart saucepan, melt chocolate with Kahlua or coffee over medium-low heat. 3 Onto a square of waxed paper, sift together flour, almond meal, baking powder and salt. 4 Stir butter into melted chocolate until butter is melted and chocolate has cooled a bit. Beat in sugar until well combined. Beat in eggs, one at a time, until well combined. Beat mixture vigorously for a minute. Gently stir in half of flour mixture, then the milk and almond extract, then the remaining flour mixture. 5 Pour batter into prepared pan. 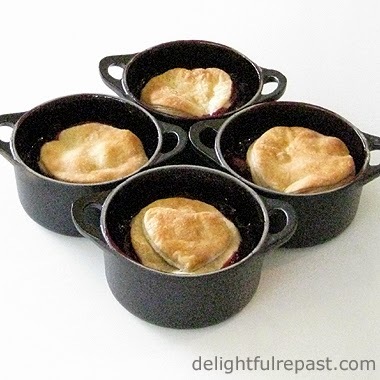 Bake for about 25 to 30 minutes. Do not overbake. Center (1- to 2-inch circle) should be a bit underdone; only the outer ring should test done with a toothpick. 6 While the cake is baking, toast the almonds in a small skillet over medium-low heat, stirring frequently. It seems like nothing is happening for the longest time, but stay focused. They can go suddenly from raw to burned if you aren't paying attention. 7 Cool cake in pan on wire rack for 10 minutes before turning out on rack to cool completely before icing. 8 In 1-quart saucepan, melt chocolate with Kahlua or coffee. Remove from heat. Beat in the butter, 1 tablespoon at a time. 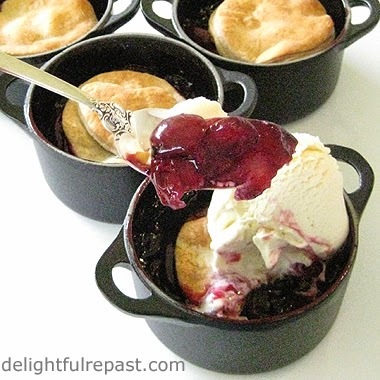 Set the pan inside a larger pan or bowl of ice and water. Beat chocolate mixture until it has cooled to spreading consistency. If you over-chill, just let it stand at room temperature for a few minutes; it will smooth right out. 9 With offset spatula (OXO Good Grips calls theirs a bent icing knife), spread icing over top and sides of cake. Decorate by pressing sliced almonds to sides or top of cake however it suits you. Homemade marmalade is so much better than store-bought that if you've only ever had store-bought and think you don't like marmalade, you need to try homemade. It will be a revelation! That said, I'm not going to lie to you -- cutting the peel into fairly fine shreds can be fiddly work. A friend brought me two pounds of organic kumquats. That's a lot of kumquats. And I usually use two pounds of fruit in a batch of marmalade. But, like I said, that's a lot of kumquats. So I decided to make just a small batch. Did I mention, one pound of kumquats is a lot of kumquats? Mind you, I'm not so speedy with a knife that I'm going to be posting videos of my slicing and dicing on YouTube or anything; but I do have fairly decent knife skills and good, sharp knives. And it took me nearly an hour. But don't let that scare you off. 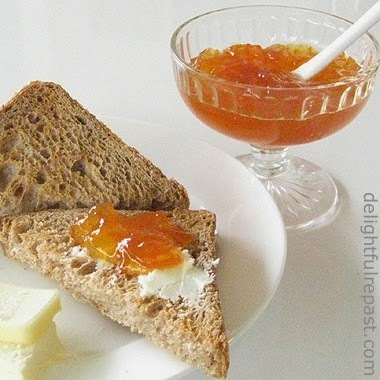 If you've never made kumquat marmalade before, you need to make this! Always use organic citrus when making marmalade. There's no peeling away the pesticides, dyes and waxes because you're using the peel. Marmalade is all about the peel! And wash the fruit well, even if it's organic or homegrown. So many marmalade recipes give inadequate or unclear directions. If you're new to marmalade-making, I think you will find the directions I give here very thorough. If something is unclear, do let me know so that I can fix it. As with any marmalade, use a sharp knife. 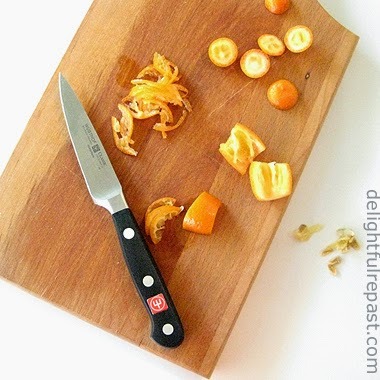 I used my Wusthof Classic 3.5-Inch Paring Knife 4066/9cm and found it to be the perfect knife for finely slicing kumquats. Someday I'm going to experiment with chopping the kumquats in the food processor, but then that will be jam, not marmalade. I do so love the lovely shreds suspended in marmalade. 1 Scrub the fruit well. Line a 1-quart bowl with a couple layers of cheesecloth (muslin, for those in the UK). Cut a piece of kitchen string about a foot long. Cut a thin slice off each end of the kumquats, then cut them in half lengthwise; remove seeds and any bits of dry pith and save them in the cheesecloth-lined bowl. 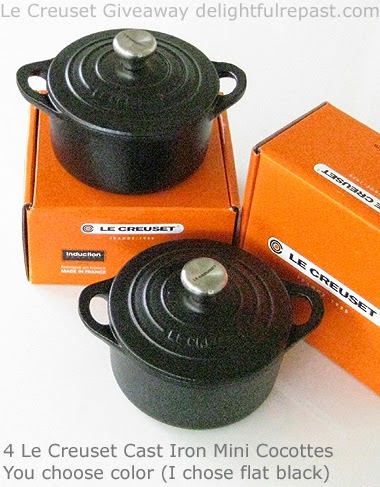 Slice kumquats crosswise as thinly as possible and put them into your jam kettle (the Le Creuset Enameled Cast-Iron 2-Quart or 3.5-Quart Round French Oven is perfect for this). Cut the lemon in 1/4-inch-thick round slices and put them in the bowl. Tie up the cheesecloth with kitchen string; put it in the jam kettle and tie one end of string to pan handle. 3 When ready to make the marmalade, get your jars ready. Get out canner (or large pot deep enough that water will be 1 to 2 inches above the tops of the jars), two kitchen towels, 2-cup glass measure, thermometer, jar lifter, tongs, half-pint jars, new lids (never reuse lids), bands. 5 Start heating fruit mixture over medium-high heat. Before it gets too hot to handle, remove the cheesecloth bag to a clean bowl; squeeze the juice into the bowl and remove any seeds that might have escaped from the bag. Pour the juice into the jam kettle; discard the bag. Continue heating and bring mixture to a boil. Reduce heat and boil very gently, loosely covered, for 25 minutes, or until peel is very tender; no need to stir. Add the sugar to the jam kettle and stir until it is dissolved. 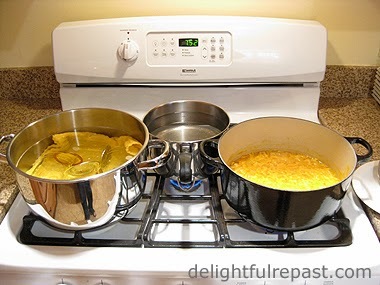 6 Bring mixture to a full rolling boil (big bubbles all over the pan that cannot be stirred down). Keep it boiling hard, uncovered, for about 30 minutes, or until it registers 220 degrees, stirring occasionally. When done*, remove from heat and let stand for 10 minutes (keeps the peel evenly distributed in the jars). Note: *Doneness can be difficult to determine. There are several tests recommended by various experts. I've tried them all, and they don't work for me. In my experience, they all result in overcooked marmalade. I cook it until it's 220 degrees and "looks right." If the marmalade has thickened and darkened a bit and it's 220 degrees, hold it at 220 degrees for one minute, then have the courage of your convictions and take it off the heat. After you've made it a few times, you'll get a feel for it. Marmalade will continue to thicken in the jars, taking as long as two weeks to set completely. 7 Do one jar at a time. With tongs, remove a jar and lid from the water. Ladle the marmalade into a spouted 1-quart glass measure; then pour the hot marmalade into the hot jar, leaving 1/4-inch headroom. Stick a knife or something (I use a chopstick) into the filled jar right next to the glass in about 4 places to release any air bubbles. Check the headspace measurement again and add more marmalade if needed. Wipe off the top of the jar with a damp towel, carefully place the lid and screw the band on "finger tight" (firmly, yes, but don't crank it down). Repeat for all the jars. Put the water back on the heat. 8 Return filled jars to the water bath, adding enough hot water to have water 1 to 2 inches above the tops of the jars. Jars must be upright and not touching. Heat to a gentle boil, covered, and set timer for 10 minutes. Adjust the heat to keep the water at a simmer. After 10 minutes, move the pot off the heat and take off the lid. Let the jars sit in the water for 15 minutes. If you're not using a rack with handles in your "canner" and don't have a jar lifter, just ladle out some of the water so you can lift the jars out with an oven mitt. Remove the jars and set them on a kitchen towel on the counter. The lids will make a popping sound when they seal, so just count the pops as the jars start cooling. Leave them undisturbed for 24 hours (don't tighten the bands or press the lid to check the seal). Then, if you lost count of the pops, check the seals by pressing on the center of the lids; they should be a bit concave and not move. Properly sealed jars are ready to be stored in the cupboard. Any jars that did not seal should be stored in the refrigerator. Disclosure: Posts may include links to my affiliate account at Amazon.com, and Delightful Repast earns a few cents on the dollar if readers make a purchase, so thanks for supporting my blog when you shop at Amazon! 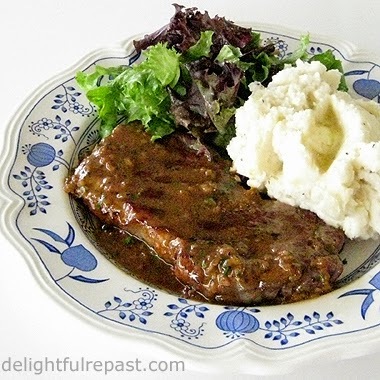 My usual Pork Chops recipe is scrumptious (especially if you're a gravy lover), but it's not one I care to make after a full day at work. It's easy enough, but takes a bit of time. 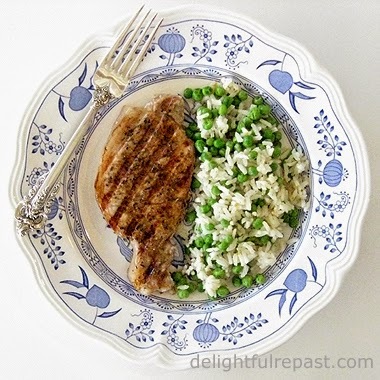 This is my new go-to recipe for when I want pork chops in a hurry. I had never used a contact grill before, so I was pretty excited when I used the Cuisinart Griddler in that mode for the first time. Since it cooks both sides at once, it cooks and browns the chops in a fraction of the time it would take on the stovetop or in the oven. Whether you're cooking for two or a small family or just yourself, the Griddler is one handy appliance to have. 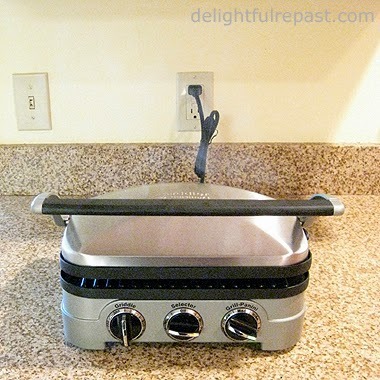 I wouldn't call this post a "review" as I still haven't tried its other functions: panini press, flat grill or griddle. I want to play with the contact grill first! Tell me, what's your favorite way of cooking pork chops? 1 In a tiny bowl, combine the salt and herbs. Rub the mixture on both sides of the pork chops. In the same tiny bowl, combine the soy sauce and sugar. Brush just the tops of the chops with the sauce. Let stand for 20 minutes. 2 With grill plates in place (they reverse to griddle plates), turn the Selector knob to Grill/Panini and the Grill/Panini knob to High. Preheat in the closed position. 3 When the green indicator light shows, place the seasoned pork chops on the grill. Close the Griddler and set a timer for 4 1/2 minutes. If your chops are thicker or very cold, they might require a bit more time. Check their temperature at 4 1/2 minutes; if it registers 150 to 160 degrees on an instant-read thermometer, they are done.